Half the Sky: Intersections in Social Practice Art followed on the heels of Woman + Body, our October 2012 collaboration with Hye-Seong Tak Lee and women artists in Seoul and Gwangju, South Korea. In March 2013, The International Caucus of the Women's Caucus for Art was invited by the Wei Er Shen, President of LuXun Academy of Fine Arts in Shenyang, Liaoning Province, China to create an art-based cultural exchange and exhibition between artists and essayists juried through WCA and women artists curated in China. This was held at the LuXun Academy April 15-30, 2014. In addition to the exhibiiton, Half the Sky: Intersections of Social Practice Art included a sixteen member delegation of selected WCA members, thirteen of whom traveled to Shenyang for the opening of this exhibition and to participate in 2-3 days of interactive events with the Chinese artists and students of the Academy. The academy was interested in providing an opportunity for Chinese women artists to interact with artists from our organization, to learn more about feminist art history in the west and share their art with our artists. Social practice art encompasses a wide range of art forms - public art, interactive media, performance, dialogue, activism, community practice, community building, interventions, and collaborations that cross art, public and social arenas. This project's cultural exchange is in itself a form of social practice form art. In the exhibition, artwork from our juried process and the curated Chinese artists will create a powerful environment in which the delegation and Chinese women artists and students will interact in a variety of events - creation of collaborative art, dialogues, demonstrations, sharing of the catalog essays and techniques and more. "Women hold up half the sky", the proclamation by Chairman Mao, has taken on many fresh facets of meaning since it's origin. Through its visual art work, this collaboration between the Women's Caucus for Art in America and the LuXun Academy of Fine Arts in China provides a wonderful opportunity to reexamine and reflect on the phrase in two dramatically different cultural contexts." President, LuXun Academy of Fine Arts, Shenyang, China . "Half the Sky opens the door for Luxun Academy and the Women’s Caucus for Art to share contemporary practices and trends in the arts. The process leading to the exchange is as important as the event itself. Half the Sky can only come to life through teamwork among women across two continents, their desire for awareness and sharing, and their deep, abiding faith in the value of global relationships. As the president of the Women’s Caucus for Art I look forward to visiting the Luxun Academy in Shenyang and participating in a cultural exchange that will inspire a creative revolution and build lasting friendships and goodwill among all participants." Senior Curator, Museum of Contemporary Art, Los Angeles. "Let us quietly feel the extraordinary powers of perception found in these women artists' response to their environment. In this endeavor to bring together the art of two cultures, may we appreciate both the difference and common ground found in the vision of American and Chinese female artists." As family friend of Jing Deng, Ms. Zhao set up the initial invitation from LuXun Academy to WCA's International Caucus. "As artists, we are in dialogue; open to communication between different languages and in search of connection to both past and present; making our roadmaps of feeling ever more open and complex." Call for Essays Juror, Half the Sky: Intersections in Social Practice Art Assistant Professor of Art History, University of Illinois - Urbana/Champaign. LuXun Academy of Fine Arts is one of the premier art academies in China and is located in Shenyang - the major metropolitan area of northeast China. 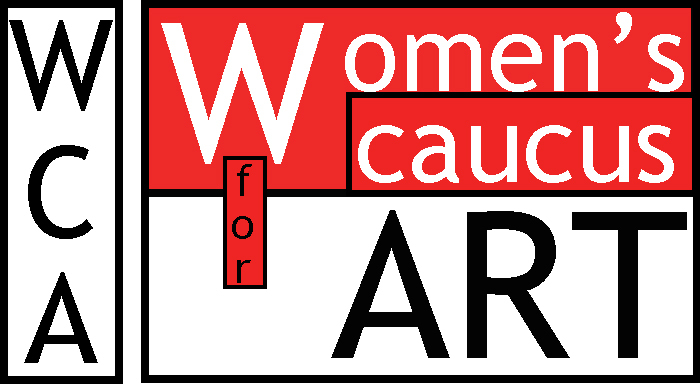 The Women’s Caucus for Art (WCA), founded in 1972, is a non-profit, UN-Affiliated NGO and national membership organization whose mission is to expand opportunities and recognition for women in the arts. Its internal International Caucus, which is directing this project, is the liaison between the Women's Caucus for Art's and the United Nations, develops art platforms to support UN Goals, and develops collaborative projects, such as this one, with other global organizations. WCA currently has over 1200 members - both national and international. WCA’s International Caucus has created art opportunities at international venues since 1995, when it sent a delegation of 100 Women’s Caucus of Arts members to the United Nations 4th World Conference for Women, which was held in several cities in China. More recently these projects have included exhibitions for UN DPI/NGO Conferences and, last year, a collaborative exhibition of South Korean and US artists titled Woman + Body was held in Seoul and Gwangju, South Korea. "Considerations and Challenges: Socially-Engaged Art in China"
Mido Lee, Rosemary Meza DesPlas, Christine Giancola, Priscilla Otani and Sherri Cornett , all working delegate artists of "Half the Sky: Intersections in Social Practice Art", an art-based exchange created by the International Caucus of the Women's Caucus for Art in Shenyang, China, April 2014, presented a roundtable discussion an OE.